This is Rana and I have another little quilt photo for you. This time I thought I would try a liberated Roman Stripes in pastel colors. It is baby sized and heavily quilted, as you can tell! 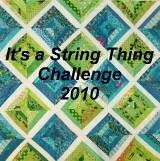 I hope you are all still having lots of fun with strings. I know I am! The next project is going to be tan and pink with a little chocolate brown or maybe a sage-y green. Decisions, decisions. Wow Rana, your string is awesome !! Love your free motion. Great job. I just love your pastel Roman Stripe quilt...it is beautiful. The "Bubbles" panto work so well with the quilt.